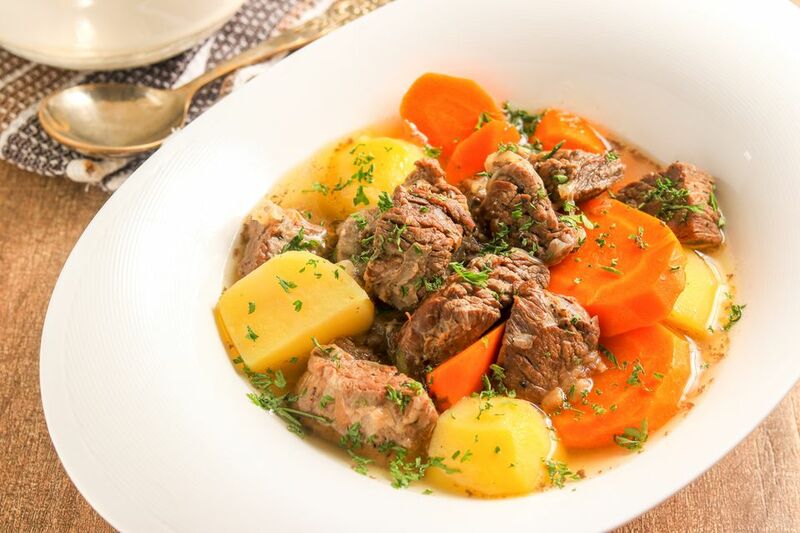 This slow cooker lamb stew is a classic combination of lamb, potatoes, and carrots. It might look simple, but the flavor is extraordinary. This recipe is versatile as well. Add a cup of sliced parsnips or diced rutabaga to the stew along with the potatoes. Or add about 1/2 cup of sliced celery or sliced sauteed mushrooms. If you choose to add more tender vegetables, like frozen (thawed) peas or cut green beans, add them about 1/2 hour before the stew is ready. Lamb shoulder meat is an excellent choice for lamb stew, or use neck meat. Beef chuck is a good alternative if you don't have lamb. Serve the stew with a simple tossed salad and crusty bread or rolls for a fabulous cool weather meal. This stew is perfect for a St. Patrick's Day dinner. Add a glass of Guinness stout and some warm Irish soda bread. Cut the lamb into bite-size pieces. Heat the oil in a large skillet over medium-high heat. When the oil is hot and shimmering, add the lamb and cook until all sides are well-browned. Meanwhile, peel and thinly slice the carrots. Peel the potatoes and slice or dice them. Peel the onions, cut into quarters, and slice thinly. Put the carrots, onions, and potatoes in the crock pot. Arrange the browned lamb pieces on the vegetables. Pour the chicken stock into the skillet used to cook the lamb. Bring the stock to a boil, stirring to get all of the browned bits. Taste and add salt and pepper, as needed. Add the hot chicken broth to the crock pot. Cover and cook for 3 to 4 hours on high or 6 to 8 hours on low. In a small bowl or cup, combine the 2 tablespoons of flour with the 3 tablespoons of cold water. Whisk until the mixture is smooth with no lumps. Stir the slurry into the stew mixture and continue cooking for about 10 to 15 minutes. Sprinkle fresh chopped parsley over the stew and serve it hot with thick, crusty bread. Irish soda bread is also a good choice, or make homemade bread or biscuits. Although browning meat for the slow cooker is not always necessary, it is worth the extra 5 or 10 minutes it takes. A good, crusty sear on the cubes of meat gives the stew extra flavor, texture, and color. To add deeper color to the broth, stir about 1/2 teaspoon of gravy browning sauce—e.g., Gravymaster or Kitchen Bouquet—into the stew before serving.